other information Wren Records Ireland WRCD 1404, n.d. Subtitle "Traditional Irish music on concertina & fiddle, live at the Crosskeys Inn." 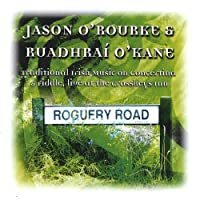 "Recorded at the Cross Keys Inn, Portglenone, Co. Antrim, 28th February 2004." Not indexed here: track 3 (Bernard's / Chez Jean-Luc), track 7 (Suo'r Gân), track 11 (Gavottes: Les Filles du Kreiz Breizh / Lan Vel ar Sonneur / Le Professeur Bourré), track 13 (The Herpin Cross).